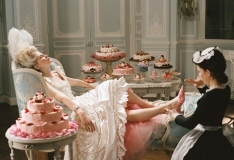 Sofia Coppola's Marie Antoinette modernizes the historical drama by grounding a genre usually most concerned with bold gestures in specificity. The first hour is dominated by awkwardness and dislocation, giving the impression that Coppola has made an anti-dramatic mood piece. It seems obvious that the titular character has been conceived less as an Austrian royal of the era than as a passive audience surrogate. Kirsten Dunst, who plays the future queen, is so self-conscious and overly styled that when someone quips that, "She looks like a little piece of cake," they’re utterly right. The obligatory events of Marie Antoinette’s life, such as her attempts to conceive, all promise the viewer with dramatic developments, only to stymie those expectations by seeming not to matter at all. The plot, as it is, is at least somewhat historically accurate, but is told from a point of view that’s insulated by any of the outside factors that defined Marie Antoinette in the public eye (she dismisses the rumors that swirl around her as “ridiculous stories”). Coppola actively provokes her audience a few times during this half of the film. 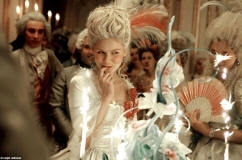 When she opts to put an aggressively modern dressing montage set to “I Want Candy” right after a scene of Marie Antoinette bursting into tears, it’s difficult to tell if she’s trying to underscore her heroine’s vapidity, striking an ironic pose, or going after something more complicated. Put into the overall context of the film, though, the latter response seems most appropriate. Coppola's selection of discreet moments from the Queen’s life gradually adds up to the kind of character development one would expect from a film that bears her name. As the movie subtly progresses, the Queen is transformed by motherhood and begins to attain some degree of self-awareness and purpose before she’s suddenly deposed. Despite the fact that the film is one giant anachronism, the overall tone here lacks the wink-wink of something like Baz Luhrmann’s Moulin Rouge. Less post-modern for its own sake than because this is how Coppola herself must have come to contextualize the queen’s experience, the film is assuredly guilty of navel gazing (as all of the director's works to date are), even though it spends so much time fetishizing Dunst. It’s a useful soft of self-absorption, though, because it seems to capture the tragic youth that proved to be the Queen’s undoing. Like Hou Hsiao-Hsien’s Millennium Mambo, Marie Antoinette creates biography as much through its soundtrack, attitudes and its close-ups as it does through its action and dialogue.